Why the 2012 Hyundai Genesis? This is a sophisticated ride that challenges the superiority often awarded to the Germans and Lexus. 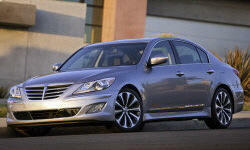 The 2012 Genesis V6 has been given a high quality ride that offers a nice balance between comfort and control. It's a large sedan, so no one will want to race it. But, you certainly have more confidence in it than comparable ES/Avalon variants, Lincoln, or front drivers going through curves fast. It feels more luxurious than the new Taurus/Lincolns and more spacious than the similarly priced Acuras or Caddys. It's a pleasant surprise, with a remarkably serene ride on most roads, and nice comfort from the seats and driver position. This car genuinely would fool a rider that they were in a limo. Wife and I smile every time we drive off. And we've taken it from Texas to Las Vegas and Florida and back to Texas in genuine comfort. The feature set is fairly complete for this price vehicle. This is an area where it is really easy to get leapfrogged by the competition, so satisfaction is a fickle thing. I emphatically LOVE the intelligent cruise control. I won't buy another car without it. The lane nanny is not as useful -- too much nagging. I wish I had Blind Spot warning, but I've yet to own a car with it, so I can't legitimately complain. The Nav system is now something I've figured out to where I like it as much as any other I've owned. Voice activation? Not for me. I'm either impatient or the Hyundai software design needs work. This vehicle has been more reliable than any of the 28 vehicles we've owned. Flawless exterior. Flawless interior. Only one recall apparently for a brake issue, despite no symptoms. Why Not the 2012 Hyundai Genesis? The 2012 crudely handles iPOD functions. Ponderous, slow, frustrating. Climate controls (heat and cooling) are great for the driver. Let's add cooling for the passenger. The service area for our local Hyundai dealership needs a complete rethinking. It would be humorous if it was any cruder.